Just give me a needle! : The Way to an 8 Year Old's Heart!! The Way to an 8 Year Old's Heart!! Robbie, the 8 year old in question, has been asking for a Creeper sweatshirt for months. And his requests got much louder closer to his birthday. The only problem?? There weren't any available in his size. So the next request?? You guessed it.......Mom, you can make one! And as that thought was running through my head, I just couldn't argue with his logic no matter how hard I tried to find excuses. If you aren't familiar with "The Creeper", this is some little creature from a very popular computer came called Mind Craft. I don't know what all the hoopla is about, but these boys are obsessed with it. I guess if I were an 8 year old boy, I would understand completely. As luck would have it, I had a pattern in my stash (Burda 9860) that I could use for the hoodie, and I found a terrific idea on The Creeper here. Katie made a pillow for her 7 year old, but I thought I could use the same concept to make up my applique. I had to adjust the sizes to accommodate the smaller surface area. If you do this, make sure you drop the hoodie in the back and mark where it falls. You don't want the hoodie covering up your work. Here is a closer look at The Creeper. I went with quilt blocks thinking it was the easiest way to do this. But I'm guessing you could use fabric paint as well. I wanted to put some batting behind the eyes to give it some dimension, but Robbie didn't want that. He has very specific ideas about these things, and he was involved in the process from start to finish. He was the talk of the neighborhood yesterday when it was finished. It was nearly 75 degrees yesterday, but he was determined to wear it for a while to show it off. And since I made the jacket a bit larger, he'll be able to get 2 year's wear from it if he doesn't have a major growth spurt. This was one of the easier patterns I've made, and the first time I've ever sewn with sweatshirt fleece. 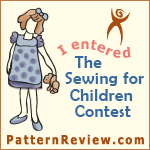 I would definitely make this pattern again and recommend it even to the novice sewist. I love how you sew what makes them happy!